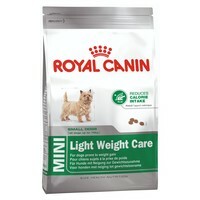 Royal Canin Mini Light Weight Care. Some miniature dogs are prone to put on excess weight. The main factor is the reduction of their energy needs, owing to: their housebound lifestyle and lack of exercise, their physiological condition when castrated or spayed. Some breeds also have a genetic predisposition to gain weight e.g. Cavalier King Charles, long haired, Dachshund, Shetland sheepdog, Cairn terrier, miniature Schnauzer. The body fat of MINI dogs develops early. Thus excessive feeding may make a puppy prematurely fat which is dangerous for its harmonious growth. A tasty food that is rich in fibre, giving a feeling of fullness that lasts until the next meal. The addition of L-Carnitine ensures a better use of fat reserves and actively helps prevent excess weight gain, while the high protein content helps to maintain muscle mass. Polyphenols from green tea and grapes, and vitamins C and E help to combat cell ageing, the reduced sodium and phosphorus content helping to prevent kidney and heart disease. I was recommended to give this to my slightly overweight dachshund. I do half and half wet and dry food. She is slowly losing weight plus a lot more exercise. I definitely recommend this product and my dachshund loves it. My dogs are really fussy when it comes to dry food but they love this and it seems to keep their weight down. I would recommend this dry food to anyone. My dog hates dried food however she loves this product. It is very small so easy to mix into wet food and must taste nice or else she wouldn't eat it (we use it as a mixer). This combined with Hills wet diet food have lost 8lbs from my dog. great product.